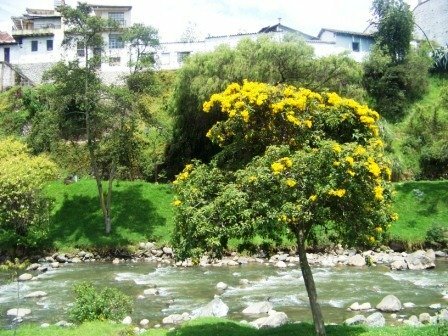 We took our very first Cuenca Ecuador trip when my dad was here for a visit. My dad has been wanting to go to Cuenca for quite a while. Partly because we have always heard about how beautiful it is. 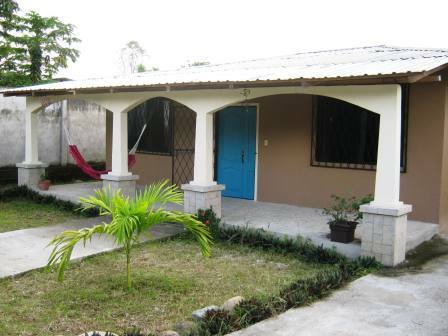 And also it has been rated one of the top places in the world to retire, so he wanted to see what the hype was all about and if it might be a good fit for him and my mom. 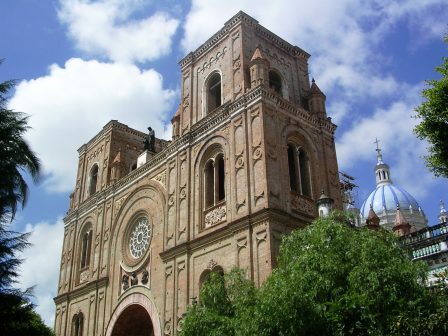 Everyone who's ever been to Cuenca talks about how beautiful it is. And guess what...they're right. I was a very nice place; the city sits in a large valley surrounded by mountains. And for a big city it was quite clean. 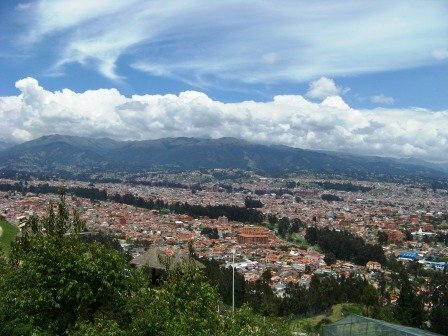 After the Cuenca Ecuador trip, I asked a friend who used to live in Cuenca about the red roofs. EVERYONE has a red tile roof. So I wondered if it was part of the city codes, but my friend said its just a tradition of the Cuencanos. I liked it; it gives everything a clean and uniform look. When we first got to Cuenca we were just going by the guide books that we had with, but we felt like we were missing out on something. While at the Parque Calderon we noticed large double-decker buses offering a city tour. (Tours leave every few hours from Parque Calderon in front of the Old Cathedral and cost about $5 per person.) We boarded one that had the tour in English and Spanish. This was an amazing way to the see the city. Though the guide's English was very hard to understand, from the Spanish version we got quite a bit of good background information about the city and saw many of the famous landmarks. The bus weaved it's way through the old part of Cuenca as the guide pointed out the colonial homes and churches that led to the city being named an UNESCO World Heritage Site. The architecture has been well preserved throughout the city. We also drove along the Tomebamba River which separates the historic center from the newer neighborhoods of the city. After a short drive through the newer section of Cuenca we made our way up to the Turi lookout. 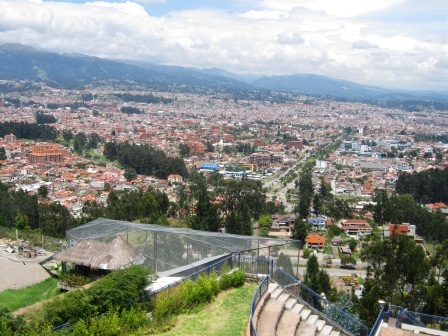 What an amazing view of Cuenca! From Turi the bus took us back to Parque Calderon to complete the almost two hour tour. It was definitely a great way to see Cuenca. 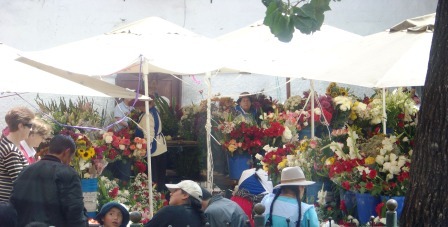 We did do some wandering on our own during our Cuenca Ecuador trip. We went into both the Old and New Cathedrals, which flank two sides of Parque Calderon. I thought the Old was more interesting than the New personally. If you go into the Old Cathedral make sure to ask about the huge hole in the room to the left of the altar. Interesting! We also went to the craft market on Av. 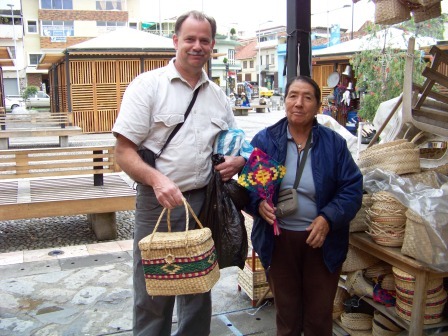 Sangurima y Machuca and found some nice baskets and other things that were different from what we usually see in the northern mountains of Ecuador. 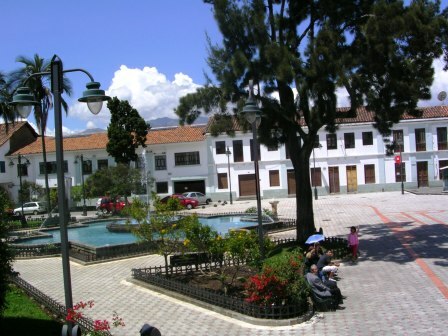 There are quite a few different markets in the historic center. 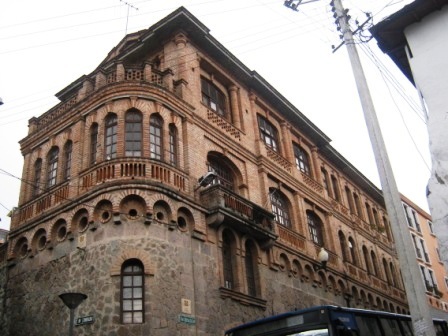 There are tons of museums in Cuenca. We chose to go to the Museo del Banco Central Museum along with the Inca/Cañari ruins found in the backyard of the museum. Read about the museum here. Cuenca's weather pattern is highly predictable. I'm used to Tena where you never know what to expect. But in Cuenca the weather is almost identical each day. In the morning the sun it out and you can even feel hot while you're out and about. But in the afternoon by about 2 o'clock you start to see the clouds rolling in. And then comes the rain, and with the rain comes a chill. Each day in Cuenca was the same and when we asked the locals they said that every day is like that. 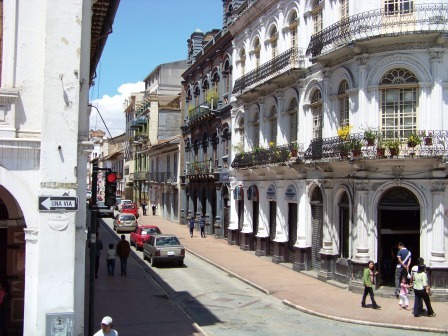 We really enjoyed our Cuenca Ecuador trip. If only it wasn't such a far drive, I would probably go more often. To get to Cuenca from the North is an all day ride through winding mountain roads. But it was well worth it!